Undergraduate Research Expo 2017 – Let Us LAUNCH "U" into Research! 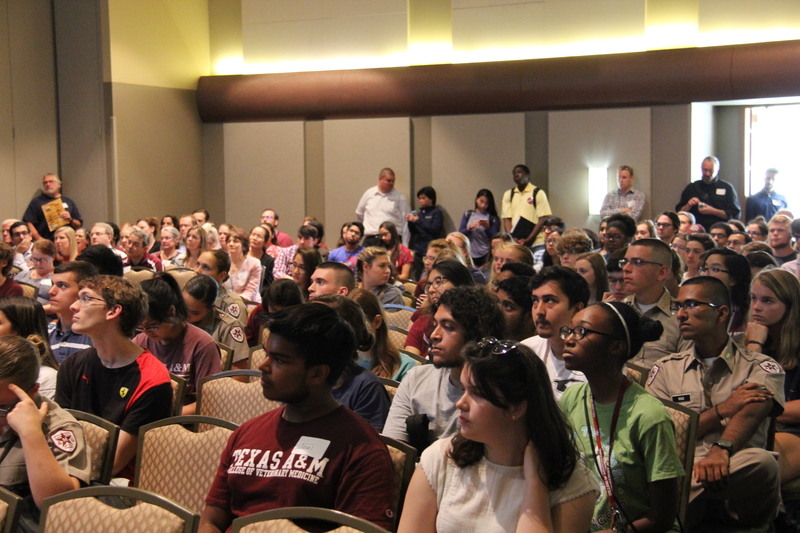 On 4 October 2017, LAUNCH: Undergraduate Research held its first ever all-day Undergraduate Research Expo in the Memorial Student Center on the campus of Texas A&M University. This Expo expanded on the two-hour resource fair held in years past. The event showcased opportunities for faculty, staff, graduate students, and undergraduate students to find ways to get involved in undergraduate research. Morning panels targeted administrators, faculty, staff, and graduate students with discussions on “Research Cultures and Mentoring Models” and the topic “Successful Integration of Undergraduates into Your Research Community.” In the afternoon, multiple spaces in the MSC were used to house concurrent events for undergraduate students that included: a two-hour Resource Fair, the Aggie Research Program’s Aggie Research Scholars’ research poster presentations, and three break-out sessions led by faculty, staff, and graduate students (LAUNCH: UGR’s Getting Started in Research, Team v. Individual Research, and Research Opportunities and Resources). Volunteers for the Expo included LAUNCH Undergraduate Research Ambassadors, Learning Communities’ Peer Mentors, and LAUNCH staff members. The day culminated with a Speed Networking Panel, in which 44 faculty from across campus presented 60-second blurbs on their research and opportunities for undergraduates, followed by a Networking Social that provided a time for students and faculty to visit informally about opportunities and involvement. Undergraduate Research supports Texas A&M’s commitment to high-impact practices and learning outcomes identified in its Quality Enhancement Program by engaging students in experiences that allow them to take learning beyond the classroom as they master depth of knowledge in their fields as well as critical thinking skills. Undergraduate Research is also one of the ways that faculty, staff, and graduate students at Texas A&M can create transformational learning through discovery of new knowledge and innovative approaches to real-world challenges. The Chronicle of Higher Education recently dedicated a special report on 8 October 2017, to the topic of undergraduate research and its importance. We have long known that undergraduate research can help increase retention and diversity, boost student placement in post-baccalaureate degrees, and provide a strong foundation for lifelong learning. The LAUNCH: UGR office now hopes to shine a spotlight on our resources and create even more opportunities for students to become members of the community of scholars at this tier-one research institution. Planning has already begun for next year’s Expo in October 2018.